The degrees offered by our 15 departments and programs encourage our learners to go out into the world to explore and grow as scholars and as citizens. 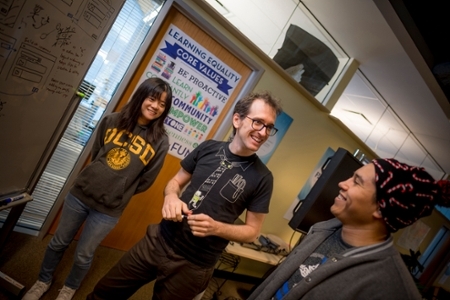 In the UC San Diego Division of Social Sciences, we care about doing good, doing well, making a difference. What do you care about? Discover your passion with us. Study all things human and our nearest nonhuman relatives, too. Put on the lenses of biology or culture to see the evolution of societies past and present. Meld computing and neuroscience to understand thinking, action and interaction in the real world. Geek out on brains, extended minds or design. Free speech. The social power of mass media. Recognize communication as a force that grows out of communities and shapes them, driving change. Question popular ideas about gender and sexuality. Challenge the status quo in a lively, tight-knit community of creative thinkers. Figure out how to alleviate poverty or navigate the stock market. Your return on investment is a marketable degree with cosmopolitan flair. Want to change schools and classrooms for the better, for learners of all kinds? You belong here, helping to create the education of tomorrow. Work for social justice, knowing power is unequally distributed and too often based on flawed ideas about gender, race, ethnicity and class. Cures, preventions, interventions. Contribute to the well-being of the world by understanding health, illness, and healing across the globe. Cells to societies, change is the only constant. Learn about growth from birth to old age. Improve lives and social services across the life span. Democracy and drugs. Gender and migration. Business and poverty alleviation. Medicine and culture. Build a career-empowering custom degree. The richness of the world’s spoken and signed languages can take your breath away. It can also translate into a career in language therapy or computing. Pick up cutting-edge tools to change the world of politics at home and abroad. You can elect prelaw or the latest in mining and crunching data. Explore behavior and emotion in experimental studies of the brain and mind. You can also take a dive outside the lab, in clinical or business psychology. Immigration and the American workforce. Inequality and social movements. What works in society and what doesn’t? Take a big-picture, fact-driven view. Sustainable cities, for the long haul. Help build an urban future that makes financial sense, builds community, and supports people and the environment.